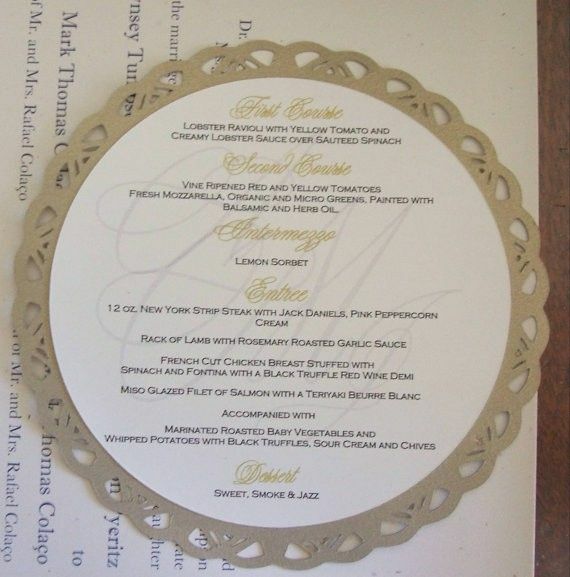 This listing is for 1 6" round diecut layered menu, great for your wedding reception or other special event. Sample pictures shown with 2 different diecut borders, many other options available will work with you to create something special if you have something in mind. Printed on 110lb cardstock, can be white or ivory, or if you prefer a color, can be used. Design elements from your other stationary items can be used to create the perfect design. I can match fonts you have used on your other items as well to keep a beautiful cohesive look for your event. larger qty please email and we can discuss cost. Please convo me with the qty you would like and I can set up a special listing for you. All items are customizable to your color palette, theme and design style.